By Simon WaxmanIn the United States today, the names Apache, Comanche, Chinook, Lakota, Cheyenne and Kiowa apply not only to Indian tribes but also to military helicopters. Add in the Black Hawk, named for a leader of the Sauk tribe. Then there is the Tomahawk, a low-altitude missile, and a drone named for an Indian chief, Gray Eagle. Operation Geronimo was the end of Osama bin Laden. Why do we name our battles and weapons after people we have vanquished? For the same reason the Washington team is the Redskins and my hometown Red Sox go to Cleveland to play the Indians and to Atlanta to play the Braves: because the myth of the worthy native adversary is more palatable than the reality—the conquered tribes of this land were not rivals but victims, cheated and impossibly outgunned. It is worse than denial; it is propaganda. The message carried by the word Apache emblazoned on one of history’s great fighting machines is that the Americans overcame an opponent so powerful and true that we are proud to adopt its name. They tested our mettle, and we proved stronger, so don’t mess with us. In whatever measure it is tribute to the dead, it is in greater measure a boost to our national sense of superiority. And this message of superiority is shared not just with U.S. citizens but with those of the 14 nations whose governments buy the Apache helicopters we sell. It is shared, too, with those who hear the whir of an Apache overhead or find its guns trained on them. 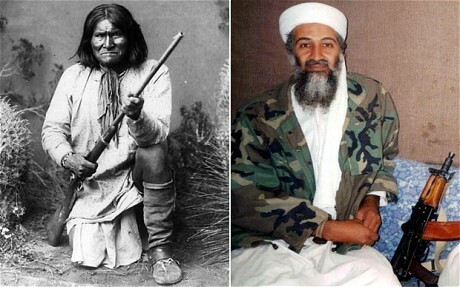 Noam Chomsky has clarified the moral stakes in provocative, instructive terms: “We might react differently if the Luftwaffe were to call its fighter planes ‘Jew’ and ‘Gypsy.’”Comment: The long debate over Osama bin Laden's codename is the perfect example of Waxman's argument. We didn't code-name him "Geronimo" because we were honoring him. We did it because we considered Geronimo a ruthless savage, killer, and terrorist--like Bin Laden. We're saying the same thing with Apache helicopters, Tomahawk missiles, and the other deadly weapons and aircraft. The're pure lethal force with no saving grace such as intelligence or compassion. They do nothing but kill. For more on the subject, see Indians in the Military.